Wouldn’t it be great if sports were just a case of picking up whatever gear you required and just hitting the field? Unfortunately (or for some, fortunately!) most of the time, you need to put some effort into both practice and fitness or muscle training to become good at the sport and rock climbing is no different. Training requires a good balance of fitness or cardio and strength training, but unlike normal training, rock climbing training requires a lot of focus to be placed on very specific parts of the body to ensure you are fit – both to prevent injury and get much more enjoyment from the sport. As with all training regimes and plans, you should concentrate on ensuring you get a well-rounded workout. Rock climbing is a physically demanding sport that requires a huge amount of strength, physical fitness, aerobic capacity and flexibility. This means that you need to target and maintain all areas of your body at a peak condition. Prepare a plan based on when you will learn in the following article to build a well-rounded plan. Rock climbers use a number of different areas of focus when they are climbing and rock climbing training should cover all of these areas. Naturally the first of these is strength – needed in many different aspects of climbing especially when it comes to overhanging or negative sloping climbs as well as long reaches which tend to stretch your body out. Secondly, what we call explosive power, which is used often in quick, difficult climbs or ‘dyno’ jumping during climbs. This is not a sustained strength, but a quick burst of energy. Endurance is where your cardiovascular training is important because often climbs can take a number of hours and that means you’re placing strain on your body for long periods of time that only a high endurance can handle. 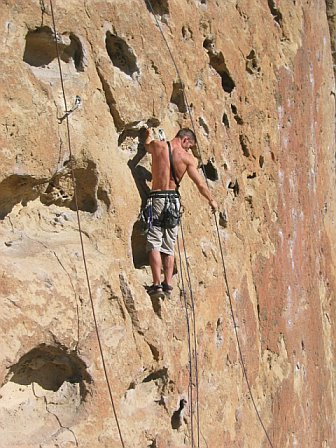 Lastly, your aerobic capacity is important when planning a rock climbing training schedule. It will improve your alertness and ability to think and act when you become tired and weary while on climbing days. Aerobic capacity can be worked on at a regular gym using their circuit or interval training setups. Many people think that the best place to train is in a gym, but for rock climbing this isn’t always true. While the inclusion of a few gym sessions is definitely advised, often the gym equipment won’t target certain muscles or tendons that need to be strengthened to prevent injury. For example, your finger tendons are often the cause of pain and discomfort following a climbing session due to tendons not being able to cope with the strain put on them and not being exercised properly. Purchasing some home equipment is a great way of ensuring that you get all the right muscles and tendons strengthened. 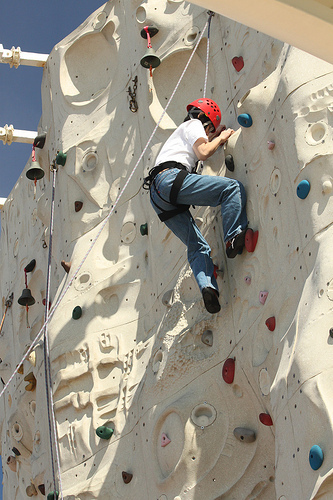 Of course, some cities or towns have climbing gyms where climbing walls can be used for this training. The very first thing you need to buy for the home is what is called a fingerboard or hangboard. The fingerboard, as you can see in the photo, is a small board made to be mounted above a doorframe where your legs can be swung freely for pull ups using different fingers or groups of fingers – the same way you would need to if you were climbing on a rock face. The fingerboard is a very effective way of quickly building strength in your hands and fingers to be able to handle more difficult climbs on the mountains. A more portable version of these is the rock ring set, which essentially accomplishes the same job. Secondly, a few dumbbells never hurt anyone. Get yourself a few pairs of dumbbells of ranging weight and work on improving the weight of the ones you use. I recommend you start with a pair of 3kg weights and follow some good guides on how to use them to build triceps, biceps and shoulder strength. Lastly, although slightly unorthodox, I recommend you get yourself a rowing machine. These are absolutely great for improving both strength and endurance and thirty minutes of intense workout on one of these machines three times a week is an excellent way to boost your strength-endurance. Injuries that occur while out climbing are often related to strain or overexerting your body beyond what it can handle and that’s why it is very important to make sure you spend the right amount of time training on the right areas. For example, a huge focus should be put on the hands and getting the hand tendons strong enough to withstand a decent amount of beating while you’re climbing to prevent a very common rock climbing injury. Working on your stretching and flexibility is also important if you want to avoid injury on the rock, especially when you are sport climbing and routes sometimes require long stretches to get between holds. I like to use my training time 60% on cardio and endurance training and 40% on strength training. Even though I have been climbing almost every week for the last 10 years, I still never stop working out the same way I did when I started climbing. You need to sustain and keep the strength, explosive power, endurance and aerobic capacity at their peak and the only way to do that is to continually train and improve them. My personal routine is to spend just one day a week in the gym, focusing on the muscle groups I wouldn’t normally train at home that the gym’s special equipment can target. At home, almost every night I work on the hangboard to maintain finger strength starting with regular pull ups until after about 15 minutes I complete a set of one finger pull ups. I also work regularly with dumbbells and the rowing machine to ensure my body as a whole gets the strength it needs for the explosive power I need. Rock climbing training is about dedication and commitment and while you might not need to go to the same extent myself and other professional climbers do, remember, your physical wellbeing is going to extend well past rock climbing and the effects of your fitness will help in all aspects of life, including your health. This entry was posted in Land Sports, Rock Climbing and tagged Rock Climbing, Training. Bookmark the permalink.